Armchair, wood and original impressed leather upholstery, with removable backrest. 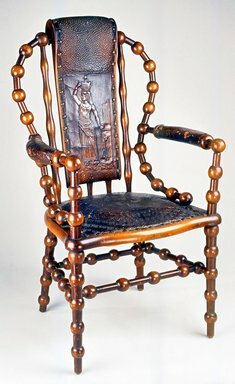 Balloon-shaped back composed of spheres alternating with short dowel segments connected by patented continuous wire that runs through the middle of each section; five upright back splat spindles with undulating contour; removable rectangular backrest in original leather with stippled headrest and standing Egyptian style figure below supporting urn on her head; shield shape seat in original leather with impressed concentric circle motifs; bowed horizontal armrests in original leather terminate in spheres; front legs, splayed back legs, and square stretcher system all composed of same alternating spheres and dowels. CCONDITION - Very good original condition; some wear to original leather, especially on armrests.